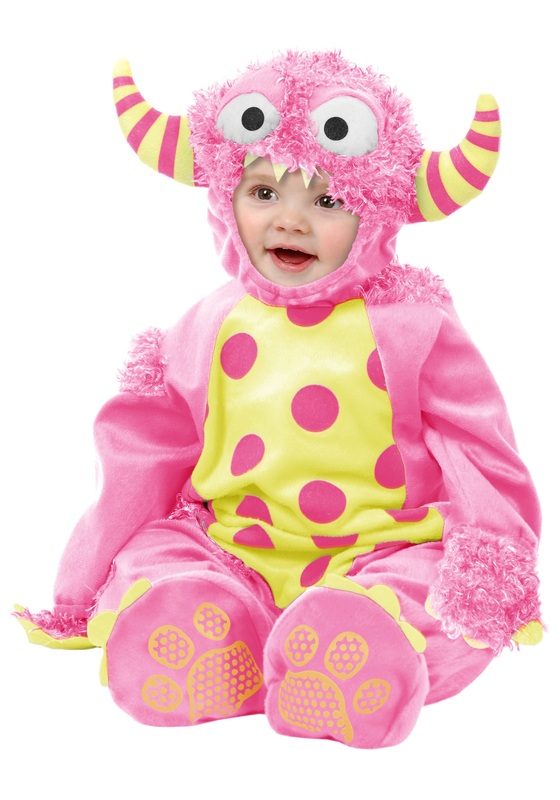 This Pink Mini Monster Costume is a fun costume for your little sweetheart! 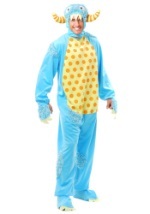 The ensemble includes a jumpsuit, headpiece, and booties all made of soft 100% polyester fleece. The jumpsuit is mostly pink, but has a yellow belly with pink polka dots; it fastens with a back zipper. There are ultra-soft faux fur patches on the shoulders, hands, belly and legs. There are bright yellow felt claws at the ends of the sleeves. The hood, which fastens with a snap in the back, is matching pink with the ultra soft fuzz surrounding the round googly eyes. The horns on each side of the hood are yellow with pink stripes. There is a jagged row of felt teeth across the top of the face opening. The booties are the same pink fleece and have yellow felt toes. 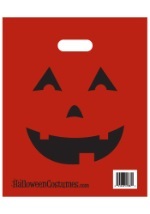 There is a skid-resistant orange monster footprint on the bottom of each. Next, she'll have to learn how to crawl under the bed!